Thousands of devotees have flocked to see a teenage boy in Nepal who many believe is the reincarnation of Buddha. The boy re-emerged from the jungle in southern Nepal after retreating there for more than a year, officials say. Ram Bomjan, 18, appeared on Monday near the town of Nijgadh, about 160km (100 miles) south of the capital, Kathmandu. His followers claim that he is an incarnation of Lord Buddha, who was born in the Nepalese town of Lumbini more than 2,500 years ago. 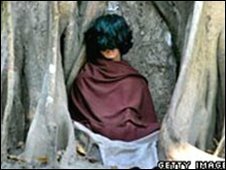 Mr Bomjan - sometimes known as "Little Buddha" - made international headlines in 2005 when tens of thousands of people gathered to see him sitting cross-legged under a tree for nearly 10 months, reportedly without food or water. Since then he has disappeared into the jungle and re-emerged several times. Officials say that hundreds of devotees, including many from neighbouring India, trekked to see him on Tuesday. "He spoke to the devotees standing near a temple in the forest," Prakash Sen told the Reuters news agency after a visit to the site. "He had shoulder-length hair and had his body wrapped in a white cloth. "Since many people are walking to see him, I think he has some of the qualities Lord Buddha had." Officials say that Bomjan plans to talk to his followers for a few hours every day for a week before returning to the jungle to meditate. Correspondents say that Buddhist priests are divided on whether the boy is truly the reincarnation of Buddha. There has been no official confirmation that he carries that status. Most Buddhists believe that Buddha himself cannot be reincarnated. However people have worshipped the teenager since he was first seen meditating in the jungle, where he sat for months, motionless with his eyes closed among the roots of a tree. Buddhism is practiced by about 325 million followers, mostly in Asia.